With a nod to Microsoft for use of the term, Tailwind Farm is your visio, your dream vision. It reveals itself as that special property for your farm and home or a lucrative business opportunity. Conveniently located close to Lake Norman, Mooresville, Statesville and Salisbury, this beautiful 17.5-acre horse farm is that very special property; ideal for a boarding, training and breeding farm, family compound, events venue, or just that dream home for you, your family and your animals. Pass through the stone columns at the gated entrance to a log and stone main house framed by a pond and large hardwood shade trees. The 2/3-bedroom home offers extensive outdoor living space including a pool and pool house, fire pit with stone bench and a large 2nd level covered deck. The aforementioned pool house has stained concrete floors, spacious living area, kitchen offering granite countertops, bedroom and bathroom with tile, frameless shower. The well-designed and updated log and stone home combines rustic ambiance and convenience with wide plank heart-of-pine flooring throughout, cable prewire, available internet and a security system. All primary living spaces and bathrooms have been renovated and updated with multiple features such as custom kitchen cabinets, honed granite counter tops, stone backsplash, breakfast counter, 2-level ceiling w/exposed beams, dining area w/built-in bench and stainless appliances. These features extend beyond the kitchen to include a floor-to-ceiling stone double-sided fireplace w/log mantel that joins the den and office. The living room has cathedral ceilings, built-in entertainment center and custom niche/display areas. The master bedroom accesses the large covered deck. There is a sunroom and a guest bedroom with balcony. The home also has an unfinished basement w/wood-burning stove and work shop. 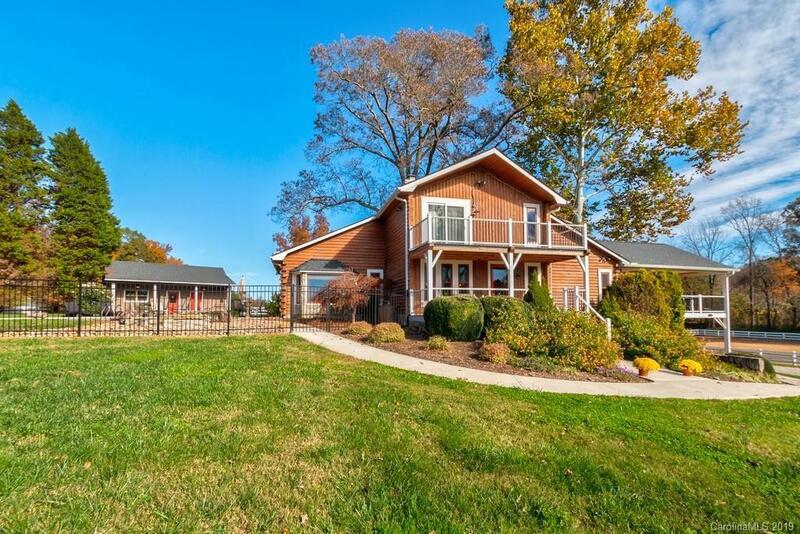 The property is likewise full of beauty and opportunity; large stocked pond, flowing stream, mature hardwoods, 2 wells and exceptional equestrian facilities consisting of a main barn, 2nd barn, hay/shavings barn, lighted 100’ x 200’ arena, spacious trailer parking, 7 pastures, a dry lot and available riding trails. The main barn has 11 stalls w/interlocking mats (crushed stone base) and fans, lights & water, concrete center aisle, fly-mist system, tack room & tool/feed room, wash stall w/heater & hot & cold water, grooming stall, half-bath and lounge/observation area. The 2nd barn provides 2 mores similar stalls, grooming area/tack room and an attached run-in shed. So, no matter your dream vision, business or just a rare home, this irreplaceable property may be the answer. Come visit Tailwind Farm.